Web services are not a new topic for web developers. Companies are slowly embracing this technology and are moving to incorporating them in their service offering. The beauty of web services is it makes available to developers the functionally and flexibility needed to come up with innovative tools and solutions. NetRegistry have just release a beta version of a reseller API tool. This will enable their resellers to integrate their core â€œcustomer facingâ€ services and portals directly with NetRegistry. This post showcase the usage of this API within the ASP.NET environment and answers the question on how to use NetRegistry API within .net 3.5. It also utilises WCF (Windows Communication Foundation) to speedup development and creates a stable bridging infrastructure between NetRegistry and your .Net application. In this walkthrough, I will demonstrate how you can connect to the reseller API using .Net 3.5 WCF Services and implementing a simple call to the service API to check for a domain name availability. Using the NetRegistry API documentation you can extend this example to place an order for the domain and check the order status. Consult your NetRegistry API documentation for more details. The best way to effectively demonstrate the technique, I will build a simple web application that will perform a domain search and return the results of Available, Unavailable and Errors. The source code for this walkthrough is available for download the the end of this post. 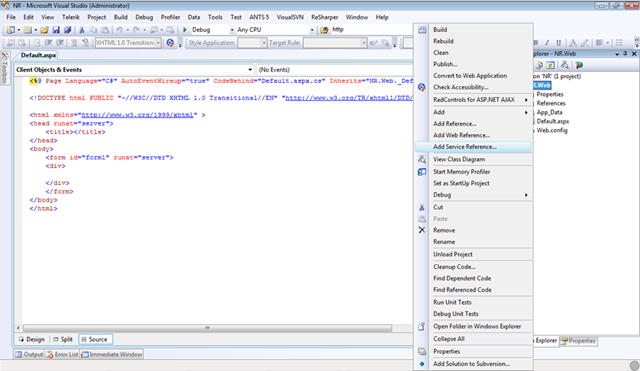 You must have .net 3.5 SP1 installed and Visual Studio 2008. 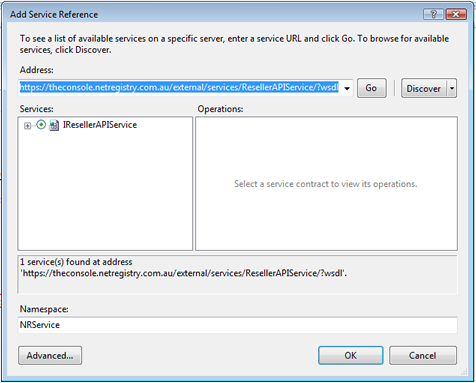 On the service dialog, copy and paste the service URL supplied by NetRegistry from documentation, then click â€œGoâ€. You will be prompted with security authentication request box, supply yourÂ API username and password. These details areÂ NOT your console username and password. Contact NetRegistry about how to get these details. after a successful authentication, you can go ahead and supply the namespace for this service. In this example, I used â€œNRServiceâ€ and click â€œOkâ€. This how the screen should look like. At this stage Visual Studio would generated all the necessaryÂ default configuration and the service objects to send requests to the service.Â However, this is not enough to start sending requests to the API. By defaults, WCF has configured this API to use â€œbasicHttpBindingâ€, which is not compatible with the NetRegistry API service. Also, Its very important to note that the address in â€œendpointâ€ has â€œhttps://â€. Because for some reason WCF â€œAdd a Service Referenceâ€ tool replaced â€œhttps://â€ with â€œhttp://â€. If this is left unchecked the service call will error due to security channel not established. Now our service is ready to be called and WCF will know how to handle the messages correctly. NetRegistry Reseller API requires that you authenticate with the API username and password on every call. 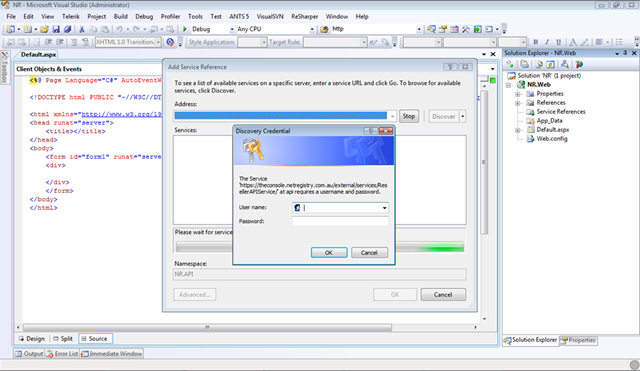 This is achieved by suppling the credential details to the service object after you initiate it. Let continue and make our call to search for a domain name availability. 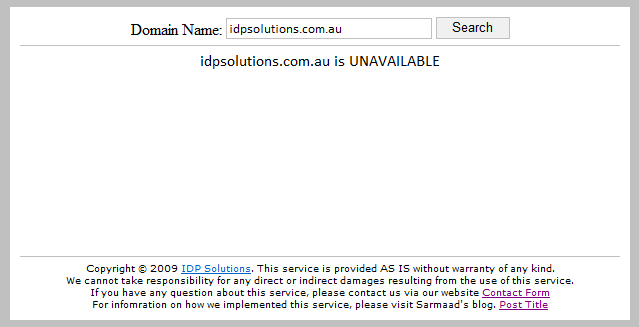 This call will send the data to NetRegistry API to search for the domain name â€œidpsolutions.com.auâ€. The result of the search will be held in the â€œresultsâ€ variable. Thatâ€™s it. Now you can follow the documentation provided by NetRegistry to use the functionality provided in the API to build your service using ASP.Net 3.5 with WCF. Leave any question or comments if you need any further help.